If you were to peek inside my dining room window at 7:00 am every morning, this is what you'd see. 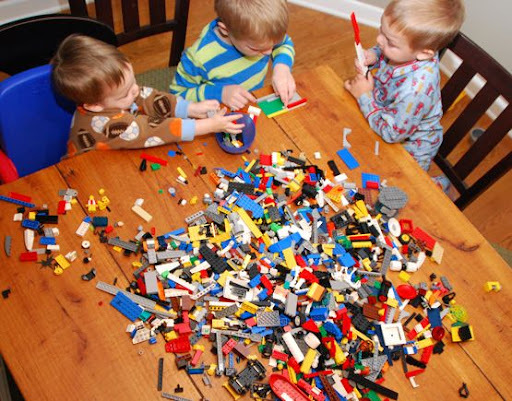 A table full of Legos. And, a sleepyhead, frazzle-haired Momma heading to the kitchen to make a pot of coffee. My boys love to play with their Legos. 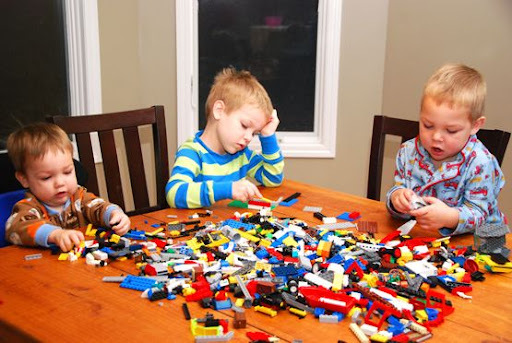 I love what their play with Legos reveals about their personalities. My Max. He's always building airplanes. He spends about five minutes building one, then zooms and crashes it around the house for the next hour. Max has his eyes on the destination. My Jack. Technical. Intense builder. He's all about concentrating on creating intricate things. This is the beginning of The Millennium Falcon. 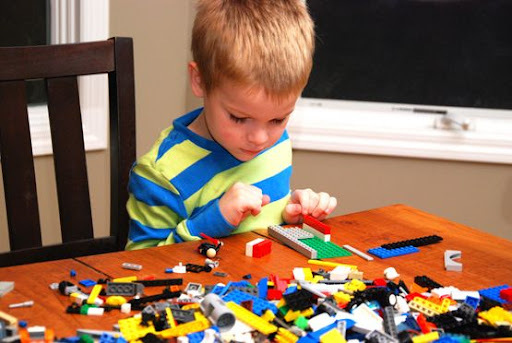 He builds it as precisely as his five year-old fingers and imagination will allow. It's all about the process for Jack. It's about the fun of getting there. He'll finish it, and then take it apart within minutes. And, then empties it out, again. Over and over and over. I love this age. The comfort of repetition. The babyness. All that Lincoln wants is to be with his brothers. To be like them. To play with their toys. But, do you know what I love just as much about this it's-still-so-dark-outside Lego playing session? They watch my boys for the early mornin', "How on earth am I gonna do this today? ", "Why do they wake up rearin' to go?, "Where is Mary Poppins or Fraulein Maria?" twenty minutes that I need to make a pot of coffee, pour in my favorite creamer, guzzle down my first cup of ambition, and gain some perspective. Instead of what's really there. And, their bright, colorful, unique personalities reminding me how very blessed I am to wake up to a new day with them. yay, legos! and also, in my case,... polly pockets. I love this post, Sarah. I love it for it's tenderness and humor and how much it reveals about your boys and your heart for them. Awesome. Love this post and your insights into their personalities! 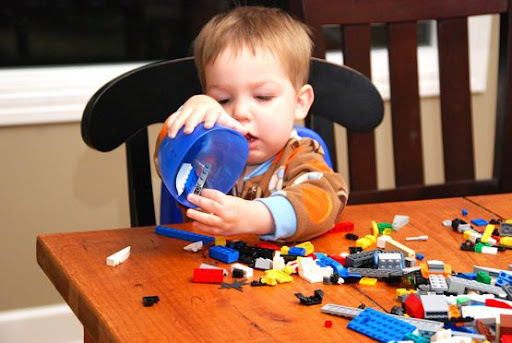 My brother and I played with Legos all the time and I look forward to our future children creating with Legos, too! What a sweet post. You have such a love for your children that comes out so clearly in your blog. I love legos too. They are a constant here in our house. It really does show so much about each personality playing with them, and is such a fun and productive thing to do together. Love this post, Sarah. Beautiful! Oh, Sarah, this is an absolutely precious post! Print it out and stick it in a scrapbook or journal. Just one question on my mind. I've been in your house, you are not real tall, so what in the world were you standing on to shoot that first photo? You silly photographer!!! Anything to get a great shot! Wow, I've said it before, you would love to spend some time with Dave and Lindsey talking shop. Such a wonderful post. It brings me back. 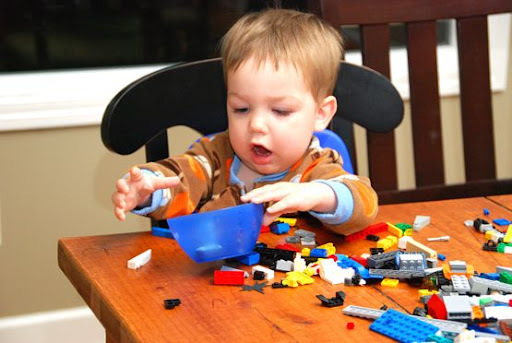 My Andy loved Legos. We had (Actually still have) tons of them. 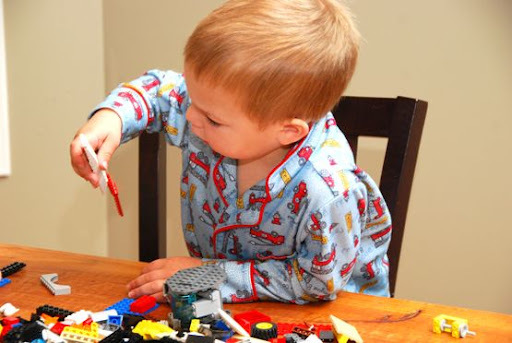 He was a plane builder like Max and had little Lego planes all over his room. What fun! Definitely a big fan of legos and their entertainment factor! Cute post! Whenever you can find a "babysitter" that is also good for them....it's a win win all around. Such a sweet post Sarah. Oh, I hear you! I have Lego imprints on my feet regularly. I climbed up on a chair. The lengths a photographer will go to for the shot he/she wants! You know this all too well! i love seeing your sweet boys playing together. fun post.